Good quality locals boozer with great character and pleasant landlady. Old school interior and well kept real ale although not much choice. A definite local boozer. The large group of locals in there at 3pm on a Wednesday looked at me like I was Eastwood gatecrashing their saloon, but then I swore loudly about a random footballer and they resumed ignoring me. The IPA tasted a bit ropey but the pork scratchings masked the taste. All that aside, the area really lacks for pubs and this place is fine for what it is, no frills, just a pub, friendly landlady, and perfectly ok for a pint or two. Definitely a locals' pub and older locals at that. This is clearly a locals� estate pub, built between the wars. Even though it�s on the CAMRA inventory of London pubs with historic interiors, there�s not much very special about the interior. There�s a fairly nondescript carpet on the floor; a few stools round the bar; banquette seating covered in blue plastic; and some sports trophies on display. There is an operational dartboard tucked away to the right of the door, with a notice board next to it displaying such useful stuff as a Met Police witness appeal, and a supposedly humorous note to be placed on cars who park too close to your car, mentioning can openers, etc. There was a TV on in one of the corners, showing some rubbish daytime TV programme. There were two handpumps on the counter, both advertising Courage Best, but neither dispensing beer. I never know why so many pubs don�t bother to turn clips round in these circumstances � perhaps they want punters to know what beer they might have had had they visited at some other time? Anyway, I quite liked the pub for its basic unpretentious approach. There were no menus (I didn�t see any reference to food so guess they don�t do it) or wine lists in evidence. But in the absence of a decent ale I don�t suppose that I shall visit again. 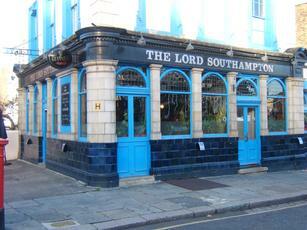 NW5 is one of those north London postcodes which has seen huge amounts of pub closures in the last four or five years, but there are still one or two local boozers surviving, of which the Lord Southampton is one. It's a fairly unreconstructed local alehouse, although perhaps unusually for a pub of its type real ale (Courage) is available, which is laudable. I understand the pub is on the CAMRA Regional Inventory because of its interior - I'm afraid it didn't strike this observer as particularly notable although the tiled exterior is nice. There is an interesting set-up with the gents here - they are in a separate building although the walkway from the main pub has its own roof. I wouldn't return here, but it's good to see this sort of pub surviving the threat of gentrification - long may that continue.